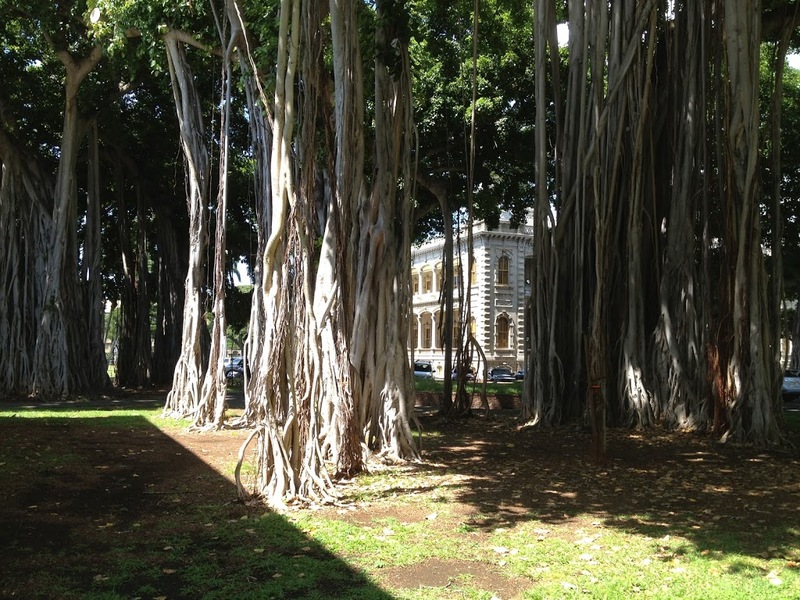 ʻIolani Palace Grounds make up eleven acres of land in the core of downtown Honolulu. After the arrival of American Protestant missionaries in 1820, high-ranking chiefs began to occupy the area. In 1825, a small mausoleum was built on the grounds to house the remains of King Kamehameha II and Queen Kamāmalu. In 1845, King Kamehameha III moved his court from Lāhainā and a large home on the site with as many as twenty smaller structures served as Hawai’i’s royal palace. During the reign of King Kalākaua the grounds were expanded to their present size. In 1882, the new ʻIolani Palace was built and this served as the state residence of Hawaiʻi’s last ruling monarchs. Wide carriage ways were added to create an oval drive entirely around the Palace. Previously, an 8-foot tall coral block wall with wooden gates divided the palace grounds from the outside world. The lowering of the perimeter walls to 42-inches in 1889 and the installation of iron fencing and gates in 1891, represented the final alterations to the grounds during the Monarchy era. There are several notable trees on the grounds. The Indian Banyan tree is the most prominent and evident tree on the mauka side of the Palace grounds. The tree was a gift from Indian Royalty to King Kalākaua. Reportedly, Queen Kapiʻolani planted the tree there. Cuttings from the tree were planted at each end of Kailua Bay in Kona. Queen Kapiʻolani was said to have planted the tree at Huliheʻe Palace in the late 1800s. The King Kamehameha Hotel tree was transplanted a few years later after not thriving at the Maguire home on Huʻehuʻe Ranch. Noticeable throughout the property are Royal Palms. In 1850, the first Royal Palm seeds were brought to Hawaiʻi from the West Indies by Dr. GP Judd. On the ʻEwa-makai portion of the grounds, there is a Rainbow Shower tree; since 1959 the Rainbow Shower has been the official tree of the City of Honolulu. On July 24, 1934, Franklin Delano Roosevelt became the first sitting president to visit Hawaiʻi. On his visit to ʻIolani Palace, initial plans were for the president to plant a memorial Kamani tree. Roosevelt’s tree is identified by a plaque, placed in 1959, which reads: “President Franklin D. Roosevelt planted this kukui tree July 28, 1934.” It was later considered the “lucky kukui tree” and was credited by some with Roosevelt’s good fortunes in the 1936, 1940 and 1944 elections. A handful of Monkeypod trees are found on the Palace grounds. In 1847, businessman Peter Brinsmade brought two Monkeypod seeds with him from his passage through Panama on the way here. One seedling was planted in downtown Honolulu (presumably not on the Palace grounds,) and the other in Kōloa on Kauaʻi. These two trees are thought to be the progenitors of all the Monkeypod trees in the state. The Huliheʻe Palace has a wardrobe furniture piece commissioned by King Kalākaua on display in one of its bedrooms. It is constructed of koa and trimmed with darker kou. 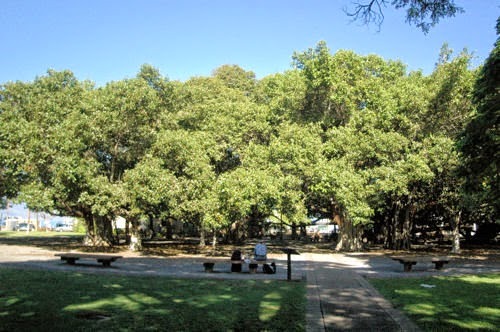 The image shows the mauka banyan tree on the ʻIolani Place grounds, planted by Queen Kapiʻolani. I have added more images and layout of trees at ʻIolani Palace in a folder of like name in the Photos section on my Facebook and Google+ pages.